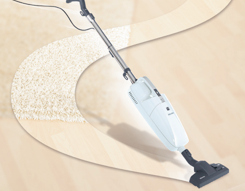 A vacuum that is ideal for cleaning wood, tile, vinyl or any hard surface floor, and can also clean area rugs and will surface clean carpet - the Miele broom vacuum can! It’s great for vacuuming kitchens, bathrooms and virtually any room in your home that needs a quick convenient clean-up. Handy for stair-steps, upholstery and crevices too. We invite you to come try one out...at your exclusive Miele dealer - Capital Vacuum.